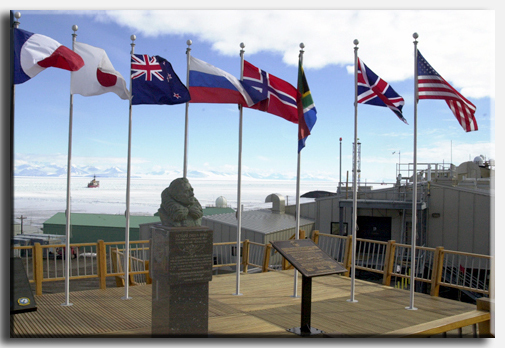 Visit the McMurdo Station webcam. Read recent reports from McMurdo Station, published in the Antarctic Sun. 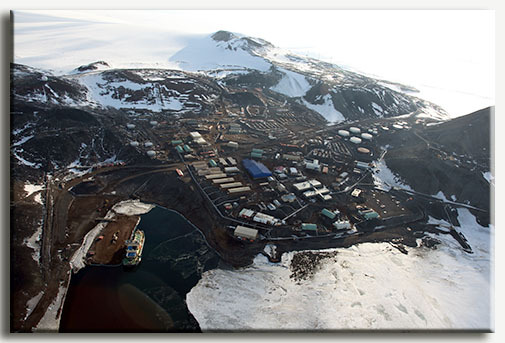 McMurdo Station, located at 77 degrees 51 minutes S, 166 degrees 40 minutes E, is the largest Antarctic station. McMurdo is built on the bare volcanic rock of Hut Point Peninsula on Ross Island, the solid ground farthest south that is accessible by ship. The station was established in December 1955. It is the logistics hub of the U.S. Antarctic Program, with a harbor, landing strips on sea ice and shelf ice, and a helicopter pad. Its 85 or so buildings range in size from a small radio shack to large, three-story structures. Repair facilities, dormitories, administrative buildings, a firehouse, power plant, water distillation plant, wharf, stores, clubs, warehouses, and the first class Crary Lab are linked by above-ground water, sewer, telephone, and power lines. Recorded temperature extremes have been as low as minus 50 degrees Centigrade and as high as plus 8 degrees Centigrade. Annual mean is minus 18 degrees Centigrade; monthly mean temperatures range from minus 3 degrees Centigrade in January to minus 28 degrees Centigrade in August. Drifting snow can accumulate about 1.5 meters per year, although the station becomes snow-free in summer. Average wind is about 5.1 meters per second; a gust of 52 meters per second was recorded in July 1968. Research is performed at and near McMurdo in aeronomy and astrophysics, biology and medicine, geology and geophysics, glaciology and glacial geology, and ocean and climate systems. Participants of the Antarctic Artists and Writers Program also work at sites near McMurdo Station.